Revenge of the fourth-place finishers. After finishing with the chocolate medal at the 2014 World Championships in Levallois (FRA), Women’s Pair Marharyta Bartashevich and Viktoria Mikhnovich (BLR) were in the thick of things in Belgium. The reigning European silver medallists edged the host country’s Laurie Philpott and Natascha Van Es by a mere 0.07 to win Women’s Pairs at the first World Cup event of 2016, a trend they’ll hope to continue en route to this year’s Worlds. Same goes for Belgium’s Arne van Gelder and Vincent Casse. 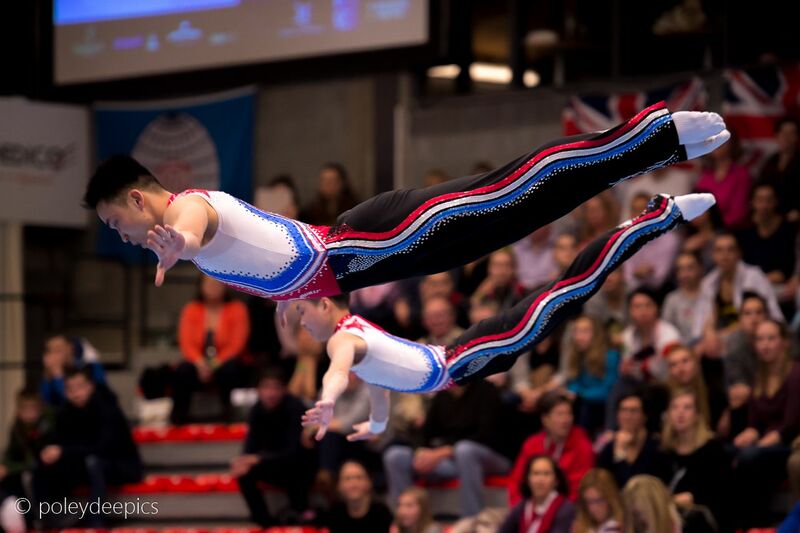 This pair, also fourth in 2014, held off the rest of the field by nearly a point, displacing Alexey Iakovlev and Daniil Kuzmin (RUS) as well as reigning World silver medallists Yauheni Novikau and Ilya Rybinski(BLR). Russians reign in Mixed Pairs. In the absence of 2015 European and European Games champions Marina Chernova and Georgy Pataraya (RUS), new seniors Maksim Soprunov and Ekaterina Vdovina (RUS) showed that they too could be counted on to deliver big results in Mixed Pairs competition. Soprunov and Vdovina won their category over Britain’s Isabella Montagna and Lewis Walker, another red hot junior-turned-senior duo. USA rising. The United States has not won gold at Acro Worlds since 2010, but given its results in Belgium, the program is on the upswing. The Americans claimed bronzes in Women’s Pair (Maren Merwarth and Jessica Renteria), Mixed Pair (Axel Osbourne and Tiffani Williams) as well as Women’s Trio, the only country beside Belarus to medal in three different categories. China starting slowly. In spite of sending gymnasts to compete in every category except Men’s Groups, the Chinese came up empty-handed in Belgium, their best finishes being fourth place results in Women’s Group and Men’s Pair (Meng Jie and Wu Shiheng). China’s quest to valorize Acro at home will really be put to the test in April, when coastal city Putian hosts the World Championships. First-timers from the Democratic People's Republic of Korea. After impressive appearances at the 2014 World Championships, the Democratic People’s Republic of Korea made its first-ever appearance at a World Cup event in Acrobatic Gymnastics. The results -- fourth in Women’s Pair (Jong Kum Hwa and Pyon Yun Ae) and fifth in Men’s Pair (Kim Un Hak and Ri Chol Jun) – give this country’s acrobats something to build on for the future. < Tabea Alt wants to get to Rio!